You can rely on Seabourne Fish for Quality Fresh fish delivered by courier to your door. For fresh fish - you can't beat Seabourne Fish. Which is why our "mail order" service has been able to grow on our reputation for guaranteeing the highest quality product to your door, wherever you live. Delivery is made by special courier and despatched from our base in Cornwall every day from Monday through to Saturday. Carefully packed in insulated, hemesthetically sealed packaging, protected from the specially shaved ice, kept cool in insulted protective packaging. 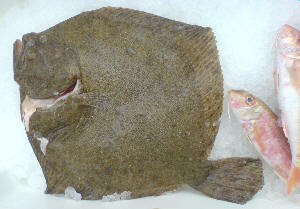 The fish arrive the next day, undamaged and as fresh as it left our fishmongers in Cornwall. With a little planning you obtain the best results from our service. Think ahead and make an Advanced order. This means you call us about 48 hours before you would like to eat the fish. At the time of your call the fisherman will be in his day boat catching your fish somewhere off the coast of Cornwall. If you select one of the "Tagged Fresh" fish, you will even be able to find out which fisherman caught the fish on your plate. The next morning (12 hours later) we will purchase the fish for you and within hours it will be packaged ready for despatch by courier that afternoon. Our "mail order" service is not only available to private individuals, Restaurants and Hotels can also benefit from our personal delivery of quality guaranteed fresh fish, direct to your place of business. Our reputation has been built on our high standards of quality and service... which is why we are happy to make our quality and money back Double Guarantee. Your QUALITY FRESH guarantee - your order will arrive as high a quality of freshness as if you had bought your fish from our shop in Penryn, nr Falmouth.